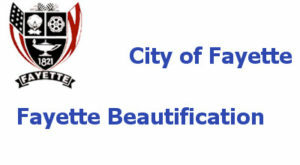 The City of Fayette and the Fayette Garden Club work to create appealing and pleasant scenes around the town. The delightful sight of flowers and plants give the city a more peaceful experience. Please review the Beautification brochure below and consider ways you may also add to the relaxing sense plants bring to the environment.